1- To see a wild alligator or a crocodile in your dream foretells a new beginning or changes in your waking life. This dream can also indicate danger in some way. If you do not kill the alligator, then this dream may not be favorable, but it is rather a caution. The alligator or crocodile within your dream can also highlight your intuition, your spiritual insights, and the spiritual steps you need to take in the forthcoming future. 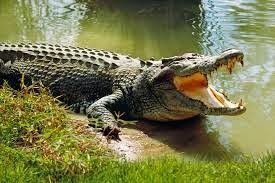 Because of its association with religion, the alligator can mean that negative aspects signify a danger which will shortly come into your life. तो अभी अध्यक्ष महोदय ने मुझे बुलाया और कहा कि तुम पूरी वाले आश्रम में चले जाओ, तुम्हारे कारण मुझे बहुत भला-बुरा सुनना पड़ा | मैंने कहा कि वे हैं कौन जो आपको भला बुरा कहा गए ? मुझे बुलाया क्यों नहीं, वहीँ उनको समझा देता ढंग से… अब वे चले गये तो आप मुझे बता रहे हो ? खैर आप क्या चाहते हैं चला जाऊं ?